In addition to being a record year for throughput, turnover and profit levels, 2017 was also a record year for investment in infrastructure by the Company. Volume growth in 2017 was again underpinned by strong growth in the unitised sector with the Ro-Ro and Lo-Lo trades recording increases of 5.0% and 5.2% respectively in terms of units handled. The combined tonnage of the unitised trades amounted to 30.1m tonnes in 2017, accounting for 82.6% of total trade through the port. Liquid bulk volumes, primarily oil products increased by 6.6% to 4.3m tonnes while bulk solid volumes fell by just 1.0% largely as a result of lower cement exports as the domestic construction sector continued to recover. On the tourism side of the business, ferry passenger numbers at 1.8 million were 1.8% higher than the previous year while the Port welcomed 127 cruise ships in 2017 compared to 109 in 2016. Within this there was an increase in the number of large cruise ships with passenger / crew numbers increasing by 32.0% from 159,000 in 2016 to 210,000 in 2017. As volumes through the Port continue to increase, Dublin Port Company’s role in delivering the required capacity to handle higher trade volumes becomes all the more important. To this end, in addition to being a record year for throughput, turnover and profit levels, 2017 was also a record year for investment in infrastructure by the Company. In cash terms the Company invested in excess of €78m in port infrastructure during the year, primarily driven by investment in the Alexandra Basin Redevelopment Project, the first major project to be brought forward under the Company’s Masterplan 2012-2040. The acquisition of lands in relation to the new Dublin Inland Port facility was also completed during the year and total additions to fixed assets as reported in the financial statements amounted to €96m. The process of relocating non-core activities to the company’s new Dublin Inland Port facility has commenced. This will ensure that lands within the port estate are used to the greatest extent possible for the transit storage of cargo. The work to bring forward to planning the second Strategic Infrastructure Development (SID) envisaged under the Masterplan has commenced with the objective of being in a position to lodge an application for planning permission by the end of 2018. In my report last year I set out the approach that the Company was taking with regard to the first review of the Masterplan 2012-2040. I am pleased that this work is now largely complete and we are currently finalising the Strategic Environmental Assessment that will accompany the Masterplan. It is envisaged that these documents will be issued in April 2018 for a final round of public consultation, with final publication expected by the end of June 2018. The review of the Masterplan has led to an increase in our underlying long term growth assumption for throughput from 2.5% per annum to 3.3% per annum. On this basis throughput is expected to increase to 77m gross tonnes by 2040 compared to the 60m gross tonnes expected under the initial plan. One of the most important outcomes from the review process is the commitment that Dublin Port Company will not seek to expand by way of infill into Dublin Bay. It is proposed to cater for this growth in throughput by utilising the existing footprint of the Port, both on the North Quays and within the Poolbeg Peninsula together with the additional lands we have acquired at Dublin Inland Port. On this basis we have prepared an ambitious Ten Year Capital Investment Programme which will see €1bn invested in the infrastructure projects set out in the Masterplan in order to deliver the capacity required to cater for the anticipated growth in trade. The reviewed Masterplan will continue to play a significant role in providing guidance and a strategic context on the future of the Port not only to Dublin Port Company but also to National and Local Government, statutory agencies and planning and development agencies. The Masterplan helps to inform National Ports Policy, Transport Policy and guides the Planning and Permitting Authorities in determining policies and specific proposals concerning Dublin Port. In 2016 the Board made the landmark decision to acquire 44 hectares of land located at the Dublin Airport Logistics Park adjacent to the M50, for the purpose of establishing an External Port Logistics Zone. The acquisition of these lands was completed during 2017. Following completion of this acquisition the initial enabling works were completed including security fencing, landscaping works and construction of a new entrance to the facility. During 2018 we will lodge the appropriate planning applications to develop individual sites with a view to commencing construction before year end. The development of Dublin Inland Port will be a key enabler in delivering on the overarching objective of the Masterplan, of utilising the existing footprint of the Port to the greatest extent possible, by facilitating the re-location of non-core activities from within the port estate. In addition it is envisaged that the lands will ultimately provide a staging area to cater for import/export cargoes as port volumes continue to grow. Significant progress is being made in the implementation of the first major project to be brought forward under the Masterplan – the Alexandra Basin Redevelopment Project. Works undertaken in 2017 concentrated on new quay construction at the western end of the basin together with the reconstruction and deepening of berths along Ocean Pier. In addition, the first season of capital dredging was undertaken from October 2017 to March 2018. The capital dredging programme to be carried out over six seasons will ultimately lead to an increase in channel depth to -10.0m CD. The total spend on the ABR project in 2017 was €64m. We have now commenced the process to implement the second major project envisaged under the Masterplan – the MP2 Project. Expansion of the existing DFT Container Terminal to provide a throughput capacity of 740,000 TEU per annum (equivalent to 47% of the throughput projected by 2040). The MP2 Project will be of a scale which will require it to be considered directly by An Bord Pleanála as a Strategic Infrastructure Development and we envisage lodging the appropriate planning application by the end of 2018. The Poolbeg West SDZ Planning Scheme was made by Dublin City Council in October 2017. The scheme, which provides a framework for the future development of the 34 hectares contained within the SDZ area, also incorporates land use zonings compatible with the Masterplan 2012-2040. Approximately half of the SDZ lands are owned by Dublin Port Company and the zoning of these lands for port development is welcomed by the Board as a key element to facilitate the provision of additional facilities to deliver the cargo handling capacity requirements envisaged under the Masterplan 2012-2040. Importantly, the land use zoning provided for in the Planning Scheme contributed to our concluding that Dublin Port could be developed to provide capacity for projected volumes to 2040 without any further infill into Dublin Bay. The Board of Dublin Port Company considers that the land use objectives of the Company for Poolbeg, as set out as part of the Masterplan Review process, are essential in the context of delivering the capacity to cater for throughput growth and that it is essential that the Company’s lands at Poolbeg are retained to cater for this expansion of capacity. The strong correlation we have seen between our volume growth and GDP growth has been evident for many years. At a macroeconomic level, the degree to which the UK’s Brexit decision impacts on GDP growth will have a knock-on effect for volumes through the Port. At a practical level, Revenue and other statutory stakeholders will need to examine their requirements in the context of Brexit – for example the HSE, Department of Agriculture and An Garda Síochána will all be faced with new requirements to ensure that the integrity of new border controls is respected in a post Brexit environment. For some of these entities there will be a requirement to inspect additional levels of cargo under their relevant statutory remits. Dublin Port Company is planning on the basis that border controls will be in place from 29 March 2019 and is working with the OPW to ensure that the appropriate facilities are in place for the relevant State agencies. Dublin Port Company values the centuries-old interdependence between Dublin City and its Port and actively works to strengthen Port/City integration. Our Corporate Social Responsibility and Soft Values strategies are the primary means to make this greater integration a reality. Through its CSR programme, Dublin Port Company commits the Port to contribute to sustainable economic development. Working with employees, the local community and society at large, we aim to improve quality of life in ways that are both good for the business of the Port and good for Dublin City, its citizens and visitors. In keeping with this commitment, Dublin Port Company is keenly aware of the strong connection with local communities which has been established over many years and the CSR programme seeks to support activities in local communities in the areas of education, sports and community projects. In keeping with the commitments set out in the Masterplan, the Board has approved a soft values framework. This framework further underpins the objective of Port/City reintegration and points the way towards developments that are compatible with the requirements of E.U. environmental legislation. Maximise public access to the waterfront and enhance the public realm by landscaping and by high cleanliness standards. 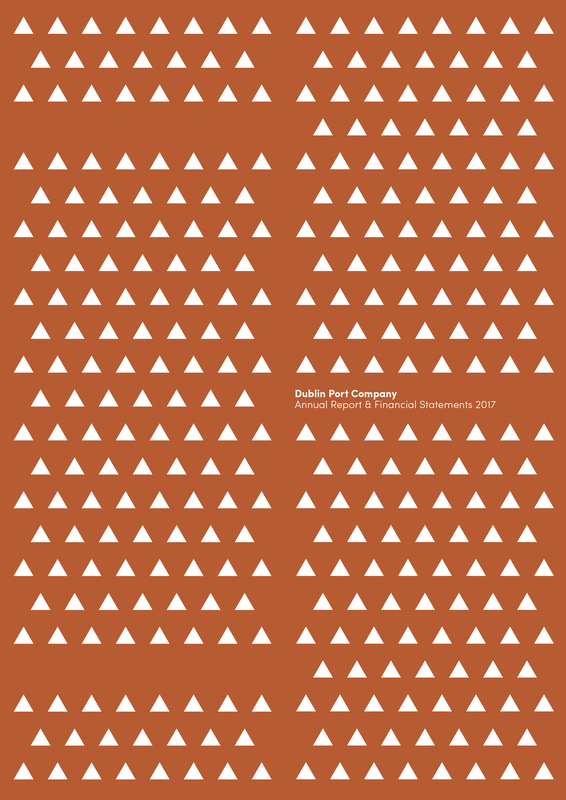 The reconfiguration and official opening of Port Centre in October was the culmination of a landmark series of cultural and industrial heritage projects for Dublin Port Company throughout 2017. Launched by An Taoiseach Leo Varadkar, TD and Ardmhéara Bhaile Átha Cliath and Honorary Admiral of Dublin Port, Mícheál Mac Donncha, the new public realm surrounding the Company’s headquarters on Alexandra Road marks the beginning of a new chapter in the Port’s history. Front and centre is a four-tonne stainless steel ball inspired by the Time Ball, which originally stood on the roof of the Ballast Office at the corner of Aston Quay and Westmoreland Street. Surrounding the plaza is a landscaped maritime garden featuring a newly commissioned sculpture ‘The Drop’ by NCAD graduate and upcoming Irish artist Eimear Murphy. Made from solid concrete, the piece plays with the notions of fluidity and design. Completing the new environs of the 1981 Scott Tallon Walker building is Crane 292, a refurbished 1960s Stothert & Pitt crane. It once served as a workhorse of the Port, loading and unloading bulky material from ships at Alexandra Quay from 1964 through to its retirement in 1997. Now restored to its former glory, Crane 292 - painted in ‘port blue’ - is illuminated at night. It provides a new focal point for docklands, a welcome enhancement to the City and port skyline and serves as an important reminder of the merchant trade that once graced the quay walls of the City. Port|River|City, a unique programme of screenings and site-specific moving image installations, curated by Alice Butler & Daniel Fitzpatrick of Aemi and artist Cliona Harmey. In addition to commissioning new public artworks, Port Perspectives featured Port Life: Eugeen Van Mieghem, a four-month exhibition at Dublin City Gallery The Hugh Lane. The exhibition brought the works of the acclaimed Belgian artist to Irish audiences for the first time, depicting life in the Port of Antwerp at the turn of the 20th century. The final strand of Port Perspectives in 2017 was Dublin Port’s sponsorship of Jesse Jones at the 57th International Venice Biennale. This was an initiative of Culture Ireland in partnership with the Arts Council. The results achieved in 2017 were enabled by the staff and management of Dublin Port Company, under the dedicated leadership of Chief Executive, Eamonn O’Reilly. The Board appreciates their fine work. We have greatly appreciated the collaboration of all those who have a stake in the Company’s success – customers, suppliers and statutory agencies. I wish to thank the Minister for his support and to acknowledge the dedicated personnel in the Department of Transport, Tourism and Sport. Finally, I wish to thank my colleagues on the Board for their work over the past year.